I love using my cast iron pan and this cake is baked in it. 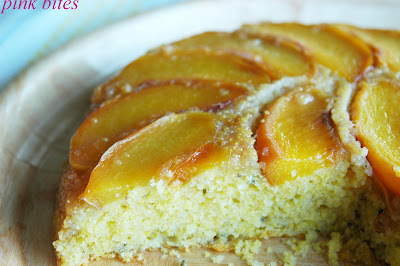 A great cake to make late summer during peach season. I thought that cormeal and lavender made an unusual and surprinsinly good combination. 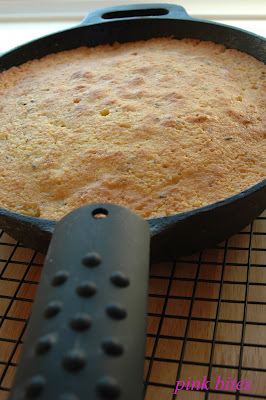 The cornmeal gives the cake its rustic texture and you can see the lavender specs in it. When I was preparing the dough, my entire kitchen was filled with a calming lavender aroma. This is a relatively fast and easy recipe to make and although it uses coarse cornmeal, this cake is surprisingly light and fluffy. The original recipe says to bake it for about 20 minutes, but mine actually took 30-35. Melt 3 tablespoons of butter in a 10-inch cast-iron skillet over medium heat, using a pastry brush to coat sides with butter as it melts. Sprinkle 1/4 cup of sugar evenly over bottom of skillet, and cook until sugar starts to bubble and turn golden brown, about 3 minutes. Arrange peaches in a circle at edge of skillet, on top of sugar. Arrange the remaining wedges in the center to fill. Reduce heat to low, and cook until juices are bubbling and peaches begin to soften, 10 to 12 minutes. Remove from heat. Drop large spoonfuls of batter over peaches, and spread evenly using an offset spatula. Bake until golden brown and a tester inserted in the center comes out clean, 20 to 22 minutes. Transfer skillet to a wire rack, and let stand for 10 minutes. Run a knife or spatula around edge of cake. Quickly invert cake onto a cutting board. Tap bottom of skillet to release peaches, and carefully remove skillet. 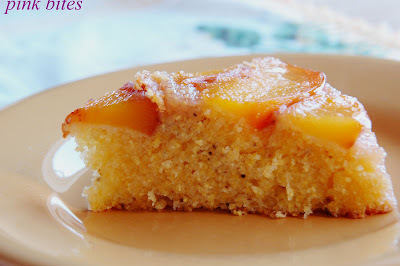 Reposition peach slices on top of cake. Let cool slightly before serving. hi rita! thanks for dropping by my blog! i loveee all the food in brazil...delicious!